Timetable: Thursday to Saturday 9:00-13:00/ 14:30-17:30 and Sunday 9:00-15:00. At least ONE (violin, viola, or cello) without any varnish but with a chemical preparation (salt) on the wood and has been exposed to UV lamp or direct sunlight. – fingerboard covered by paper isolating scotch tape to protect it from UV rays. In case the instrument has no fingerboard it has to be covered with a piece of wood on the glueing surface neck/fingerboard. 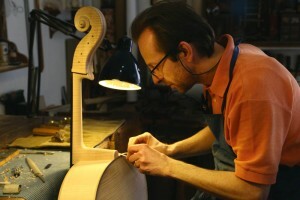 – wooden stick in the button hole or in case of a cello a support in place of the endpin. – transparent varnish (oil+resin) of your own production that you usually employ, or commercial varnish that dries in 12 hours – 50cc are enough for violin and viola.